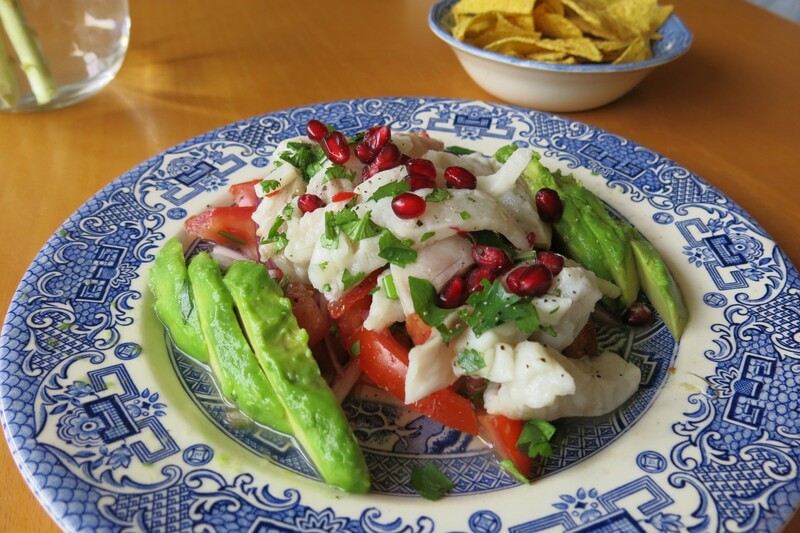 Sea bass ceviche is the ultimate summer dish. Fresh, light and has the added bonus of being incredibly healthy! 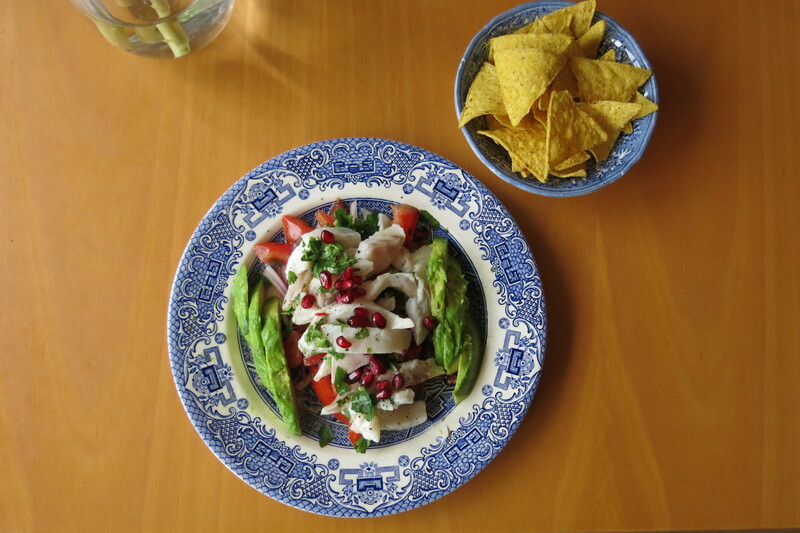 I recently went to my local Mexican and didn’t want the usual carb overload and so I ordered the sea bass ceviche. I had forgotten how much I loved this dish! It’s so fresh and tangy and packed full of flavour so you don’t feel like you’re missing out. It’s a lot easier to make than you think – don’t let the idea of raw fish put you off! I love mine with avocado but the tortilla chips are totally optional. 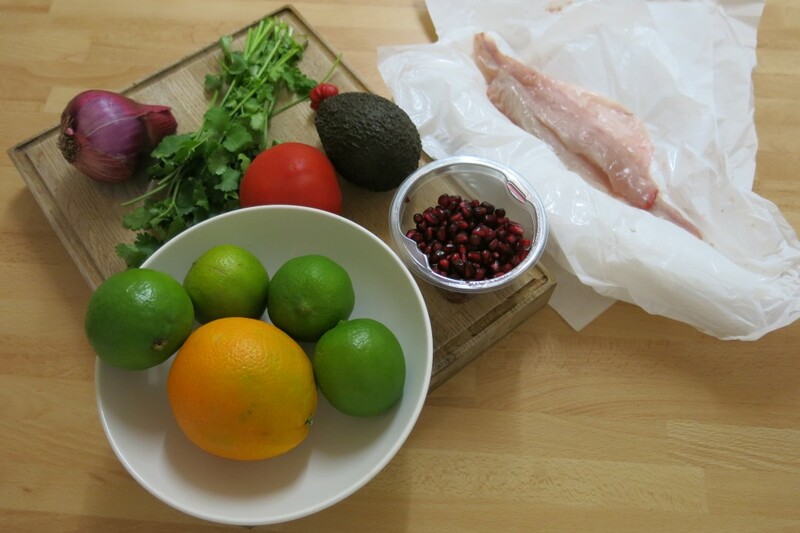 I did a lot of reading before I decided how long I would marinate my sea bass and what marinade I would use. In theory you can use any white fish but some can disintegrate in the lime juice – the consensus seems to be sea bass. Some recipes say to only marinate (“cook”) the fish for 10 minutes, others say up to 4 hours. I tasted my fish at 10 minutes, and it felt slightly tough. Again at 20 minutes it still wasn’t right. 25 minutes and it melted in my mouth so I knew it was time to serve. Make sure you use the freshest fish you can get your hands on – I went to my local fishmongers and got them to fillet and debone the fish. Sea bass – whole fish, skinned, filleted, deboned. As fresh as possible. The first thing you need to do is to rub some salt into your fillets of sea bass and leave it for a few minutes. Then slice your sea bass – I like mine about 1cm wide and 2 to 3cm long – nice bite-size pieces. 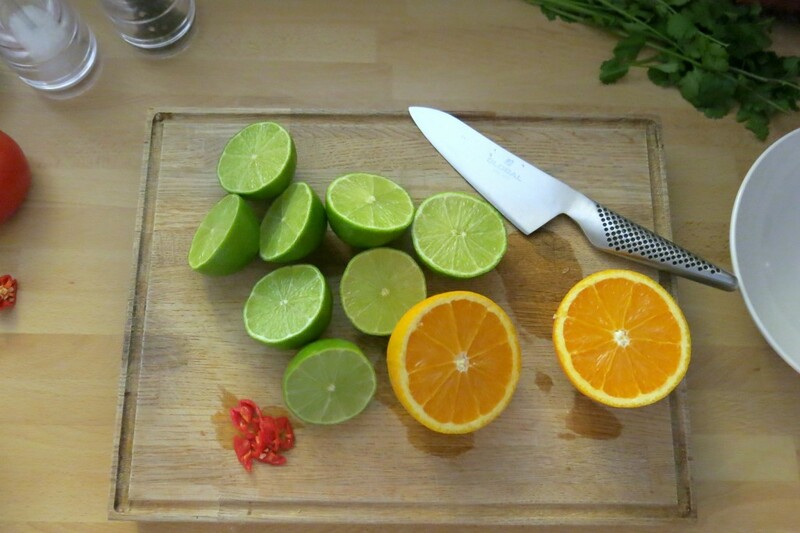 Place this into a bowl and add the juice of 4 limes and the juice of 1/4 orange. The orange adds a different dimension to the citrus flavour and it was something I’d seen in a few recipes. Add your sliced chilli; I used a small amount of a scotch bonnet, I like the kick of these but it might be too hot for some, so just go with a birds eye chilli if you like a more mild spice. Put in the fridge for 25 minutes. Whilst your fish is marinating, slice your red onion and tomato and roughly chop the coriander. 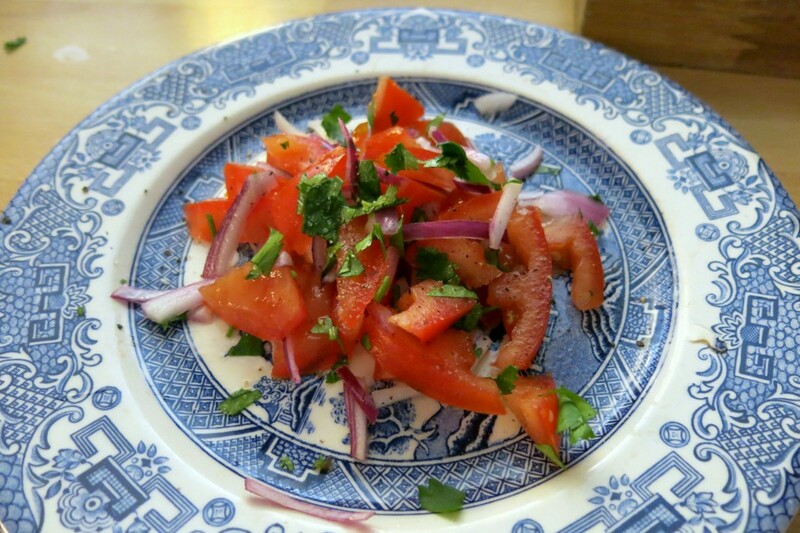 Place the onion and tomato onto the plate with a little of the coriander and season to taste. When your sea bass is ready spoon it onto the tomato and onion with as much of the juices as you like. Add the avocado at this point. Sprinkle with the pomegranate seeds and some more coriander. Then serve with plain tortilla chips and enjoy! How easy and quick is this recipe!? 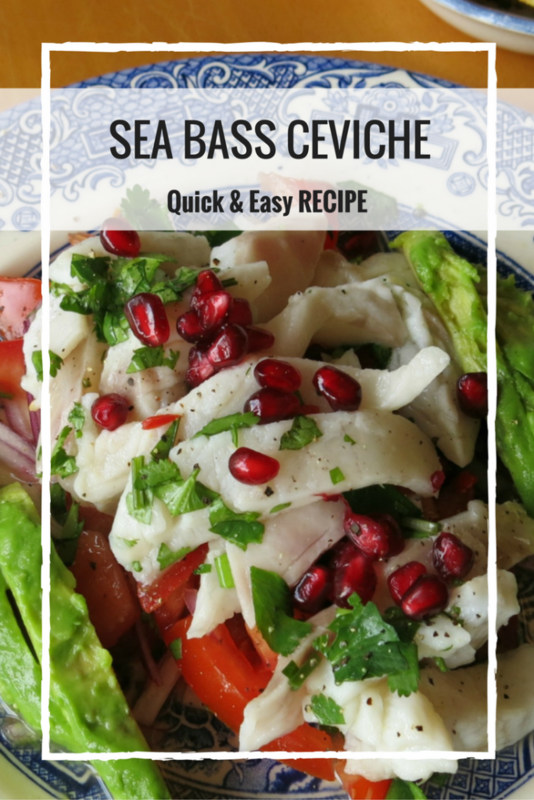 This obviously tastes great with a nice cold Sol beer or margarita, but then I suppose thats not so healthy… Either way, sea bass ceviche is the perfect dish for a long summers evening.